if you're debating between the 2 blu ray sets that offer the trilogy (there are two) they are identical except for packaging and one is cheaper than the other. 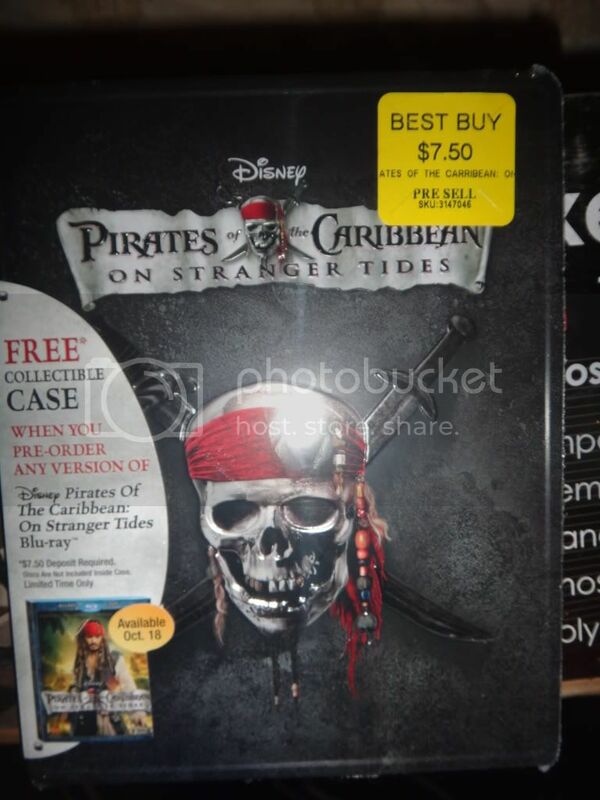 On Stranger tides in 8 more days! This title will be released on October 18, 2011. Metal sleeve version is already out. Somewhere through Amazon. Apparently the DVD cover is made out of metal and 3D shaped. Apparently the metal sleeve is something for collectors of this style cover. Only the cover is different but the contents are the same. Saw it over on RPF. It be worth getting the real expensive box set of all four movies but there are NO NEW CONTENT added to the previous three movies which makes it difficult to justify rebuying the same movies. $5.00 off coupon for 5 disk set! correct me, but there does not seem to be a separate disk for special features? got a call from suncoast today telling me my reserved dvd's release date has been pushed back a month. They will, however, stock the "Combo", whatever that means. where is the wedding short film? Lego short on DVD disk. Hey did anyone notice my photo manipulation on DVD cover above? Bilge Rat wrote: Lego short on DVD disk. Didn't catch it at first, but then I saw it. Nicely done! Kind of a bummer. No behind the scenes in the bonus features. Actually not much of anything except the gag reel. yea..... and the lego shorts are.... commercials. Hardly features. WHERE IS THE WEDDING SHORT WE WERE PROMISED? "All new Blu-ray bonus disc which includes an all-new short film and more!" BroadSword wrote: Kind of a bummer. No behind the scenes in the bonus features. Actually not much of anything except the gag reel. Yeah...unless you buy the 5 disk blue ray/3d/dvd set. Which I did, even though I don't have a blue ray player (plan to buy one for myself for Christmas...the joys of bachelorhood!) I also plan to pick up teh mega set at some point. Just waiting a bit to see what else they may come out with.